Wolves 1 – 2 Newcastle – Move. Run. Sports. 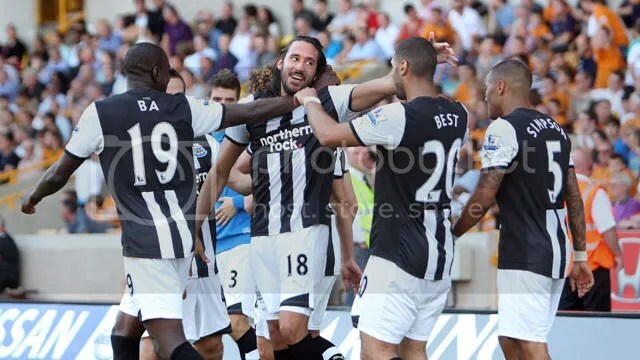 Our fantastic start to the season continued with a 2-1 win over Wolves. Although the scoreline makes it sound a lot closer than it actually was. Although at the end of the game Wolves did have the ball in the back of the net which would have made it 2-2. But before that we really did outclass them all over the pitch. They seemed to completely crumble after scoring our first goal. Which saw Demba Ba get his 4th goal in 2 games, with a good header from a Cabaye corner. We created a few chances after that, with the easiest falling to Jonas who decided to put it past the post instead – which looked like the easiest possible chance. But no-one could have predicted the magic which Jonas would have produced to double our tally to 2. With a magically goal, beating 4 players and slotting the ball home – what a way to celebrate signing his new contract earlier in the week. It really was something special and something we all no he is capable of, we just wish he could do it more often. Tim Krul put in another fantastic performance as well and must have been given man of the match again. He really did make some outstanding saves from start to finish, his confidence must be sky-high at the moment as well. The defenders in front of him are doing their bit as well. I think Cheik Tiote is well and truly back to his best form now after a slow start to the season, he owned and bossed the midfield yesterday afternoon. No Wolves player could get close to him. Cabaye had a pretty quiet afternoon but that’s not really a bad thing because of the way Tiote and Jonas were both playing. Obertan is looking very hit miss, you just really have no idea what he is going to do next. Taking nothing away from the lads it was a very good performance and we are still unbeaten in the league and currently sit in third place . . . who could have predicted this!